This dish is actually simple to make, and it makes enough to serve three or four, which helps out with my aversion to prep work and dishes during the middle of the day with kids hollering and generally wreaking havoc all around me. 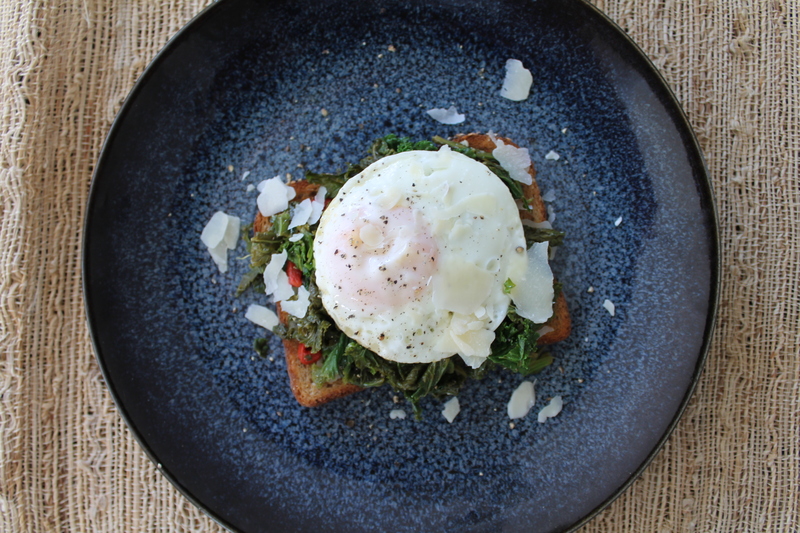 Plus, you know I love a good open-face sandwich, and anything that comes with a fried egg! The most tedious part is prepping the greens. I was in a bit of a hurry and I didn’t chop them quite as thoroughly as I normally do; this turned out okay, but it certainly made the sandwich harder to eat neatly! So. Rinse and chop the mustard greens. 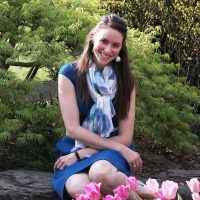 Of course, you can use any kind of greens you like: kale, dandelion, chard… Mustard greens are nice because they stand up well to heat without turning black instantly, and they have a slightly peppery flavor. 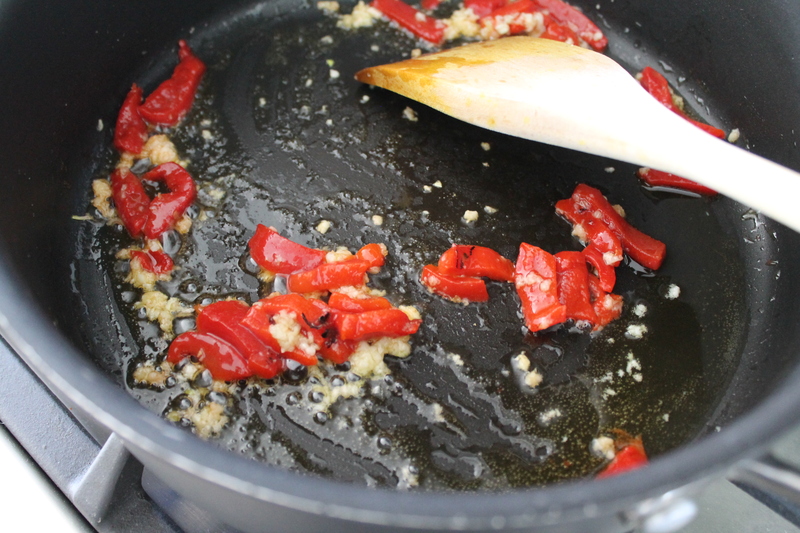 In a large saucepan or skillet, warm some garlic in olive oil over medium heat. Add a handful of roasted red pepper strips and allow them to warm as well. The goal is not to brown the garlic, just to get it nice and fragrant. Add about half of the mustard greens to the skillet and let them sit for a minute or so, to begin to wilt. Stir and let them wilt a little further. When there is room in the pan, add the rest of the mustard greens and cook until the whole mixture is wilted, but still green. If necessary, you could add a few teaspoons of water to aid the process; I found that the leaves were wet enough after washing that extra water was not needed. 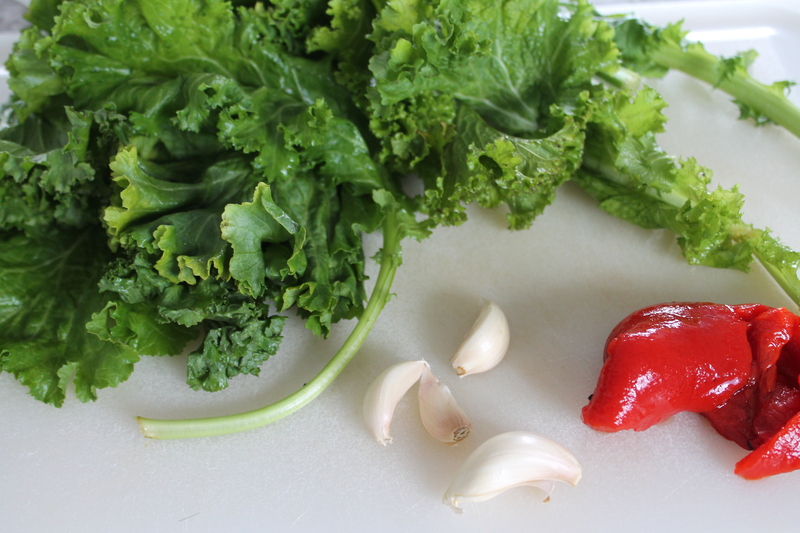 When the greens are wilted, season with lemon zest, salt, and fresh ground black pepper. 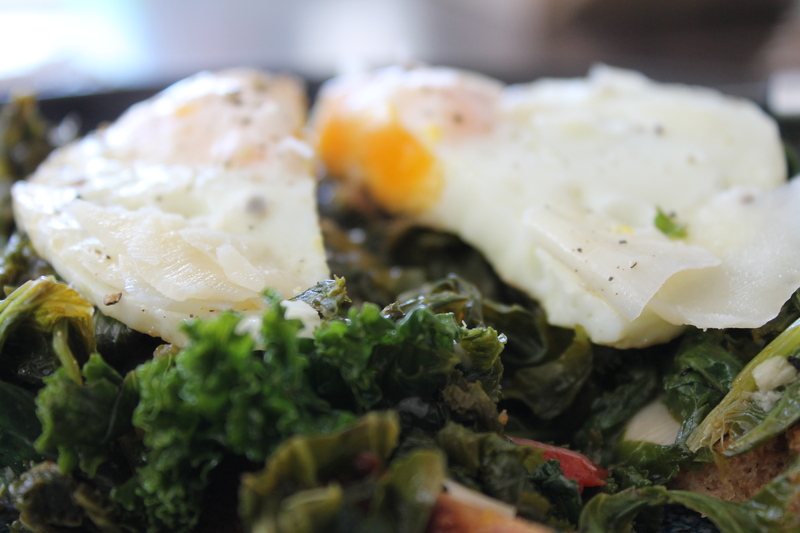 Set the greens aside while you prep the toast and eggs! Lightly brush your bread with olive oil. You can use awesome, fancy bread, like bakery brioche, or plain sandwich bread. Guess which one I used? Broil the bread for 2-3 minutes, until golden brown on top. Meanwhile, fry the eggs! I always add a pat of butter to the pan, because my non-stick pans…aren’t. Also butter is creamy and amazing. You know it’s true. 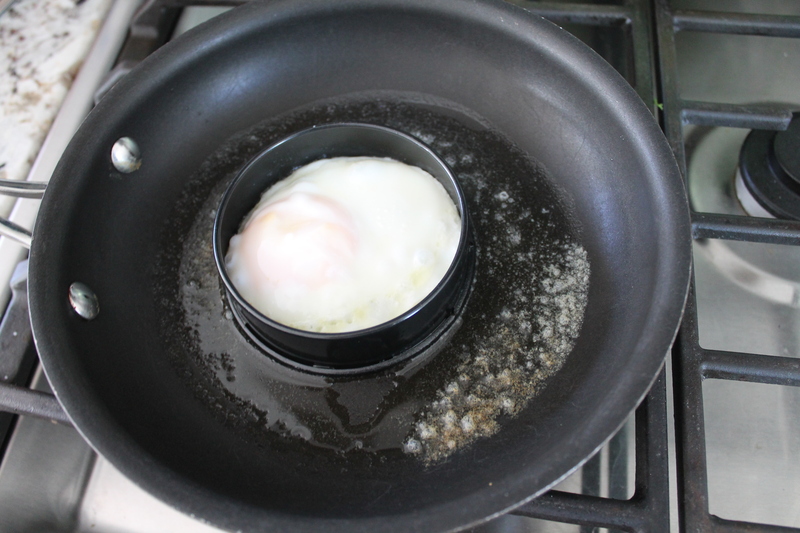 Cook the egg to your desired doneness. I generally prefer my eggs to have warm, runny yolks. So luscious. But, you know, when you get distracted while cooking eggs, sometimes you end up with no runny yolks. The sandwich was still delicious, and much less messy, this way! Assembly time! Layer a tiny amount of shaved or shredded parmesan on the toast. Add a hearty spoonful of greens. Drizzle the greens with a little lemon juice. (Doing this just before serving, instead of mixing the lemon into the whole thing, like I did, will result in less browning!) Top with the egg, some cracked pepper, and some more parmesan. What a lovely and nutritious lunch. Eat your greens! In a large skillet, heat 3 tbsp. olive oil over medium heat. Add the minced garlic and cook, stirring for 1 minute, or until fragrant. Add the roasted red pepper and cook 1 minute more. 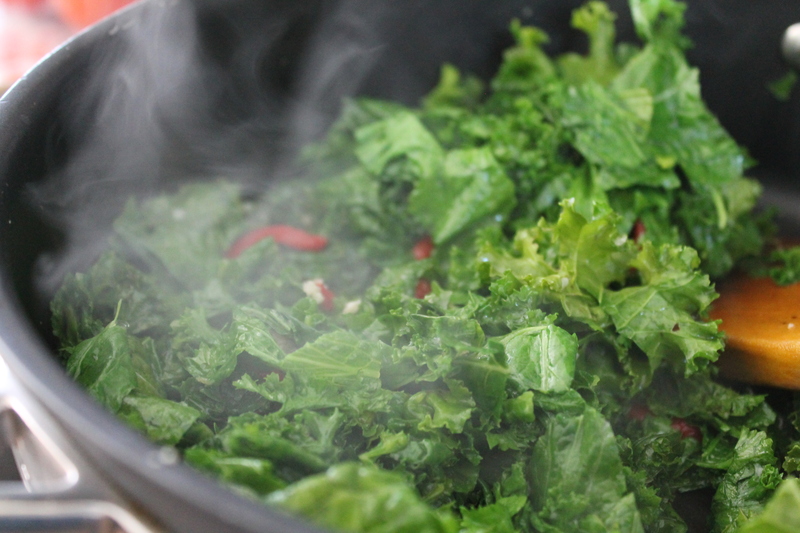 Place about half of the chopped mustard greens in the pan, tossing until slightly wilted. When there is enough room, add the remainder of the greens, tossing until wilted. The liquid should be cooked off, and the greens should not be brown; drain if necessary. Season with lemon zest, salt, and pepper. Remove from heat. Fry the eggs as desired (runny yolks highly recommended!). Meanwhile, brush the bread with as much of the remaining olive oil as needed. Toast under the broiler for 2 minutes, or until golden brown: keep a close eye on the toast, as it could burn quickly. Assemble the toasts. Layer a small amount of parmesan on each piece of toast, followed by one-quarter of the greens mixture each. Drizzle the greens with lemon juice. Top with a fried egg, extra black pepper, and more parmesan. Serve warm, with a fork and knife. It’s been more changing than I thought! I clearly also needed a diet reboot!